The little bursts of lemony Limoncello flavor in each bite are at the top of a long list of things I love about this cupcake recipe from Baking Chez Moi by Dorie Greenspan. This week’s Tuesdays with Dorie baking group brings an over-the-top sweet treat to my blog. I will say that this is one of those recipes you find in a cookbook that makes the purchase worthwhile and I almost passed on this week because I’m not a huge lover of Limoncello. But, I remembered a small unopened bottle of homemade Limoncello that we received as a Christmas gift last year stashed away in the back of the fridge and thought, why not? Like most bakers I like to use up ingredients that I have on hand in my pantry but in this case both finding the homemade Limoncello and then using it in my cupcakes was a kind of a match made in heaven. I decided to double the recipe for Limoncello buttercream frosting to use both for the cupcakes and as a filling for a batch of French Macarons, one of my latest baking obsessions. I don’t know which one of these creations I like better, the cupcakes or the macarons, they are both so good with the frosting. Now I’m thinking I need to make homemade Limoncello, such a cool idea for gifting. Limoncello cupcakes and macarons are also great ideas for baked gifts to share. 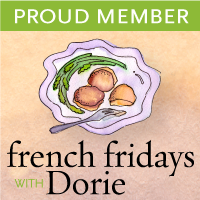 As you know from my previous Tuesdays with Dorie posts we have been asked not to share the recipes but I’m going to share a few links for recipes I find interesting that are related to this post. How to Make Homemade Limoncello and Baking with Limoncello ideas from Pinterest. Please check out the other baker’s projects at Tuesdays with Dorie here. Just a few notes on this baking project: I used a large star tip to pipe the frosting on the cupcakes. I also chilled the frosting for about 30 minutes before piping. I used plain white cupcake liners for baking but served the cupcakes in decorative liners, as the cupcakes become sticky from brushing on the Limoncello after baking. A small piece of sliced lemon makes a nice easy decoration on top of the frosted cupcakes. Beautiful Patty! They sound super delicious. Love Limoncello! Your cupcakes are like a little ray of sunshine in their yellow wrappers! I love your little star shape of frosting – so cute! These cupcakes are destined to be my new favourites! What lovely cupcakes! I haven’t used Limoncello, but would happily hunt it down (or make it myself) to try these. These cupcakes look heavenly! I love lemon flavour. I like your lemon garnishes! Your photos are great! Okay, those macarons sound amazing and your cupcakes are lovely too! So pretty with the sunny decorative wrappers and lemon wedge garnish! Beautiful photos. I love the lemon garnish on top! your photos look like pure sunshine gorgeous! I can tell these were good, and how nice that you had some homemade limoncello to use here. Patty, love these. I once made Limoncello with my Nevada neighbors, one a graduate of culinary school and the other, a Sicilian. Man, was that Limoncello delicious. I didn’t finish the bottle and left it behind when I moved. I definitely have to buy a bottle and park it in my freezer. I understand from a friend here who is baking from Chez Moi that these cupcakes are fabulous. Thanks for the baking tips. I am not a fancy frosting gal but I think I can do star tips and I think it is lovely. And, thanks for the tip on telling me to use paper liners first. I was going to bake them in my fancy cupcake paper liners so am glad to know this. Lovely. Wow your cupcakes look perfect. Even your wrappers match. Thanks for the limoncello link on Pinterest. Now I know where to go to use up some limoncello, I have a big bottle. Your cupcakes look so great with the little lemons on top. Lemon sweets are a personal favorite. Meaning I might need to keep a bottle of Limoncello on hand just for this recipe! The photos of these luscious cupcakes are marvelous! There is nothing as delicious as a bright, lemon dessert, Patty! Your presentation is lovely and they look wonderful! Your cupcakes looks like a burst of sunshine! Very pretty! and yes, Limoncello is on my list of to do~! Those little snips of lemon plus the liners make those cupcakes seriously professional! Gorgeous! Beautiful and delicate cupcakes, Patty. The frosting is so pretty and how you’ve garnished it! Luv the little cupcake papers you’ve used and thanks for the link to homemade limoncello – pinning! So very pretty! Your cakes look like a ray of sunshine. Love the wrappers and plate. I was going to use a twist of half of lemon for decoration, until I saw yours. Thanks for the perfect topper idea! I love lemon desserts & Limoncello – and these look just perfect! I’ll have to try them!